Entdecken Sie Kauais Höhepunkte und versteckte Schätze auf einer ganztägigen privaten Tour, die einen persönlichen Einblick in die lokale Kultur und Geschichte der Insel bietet. Navigieren Sie durch die Garteninsel in einem privaten Kleinbus und fühlen Sie den Sprühnebel von ein paar schönen Wasserfällen. 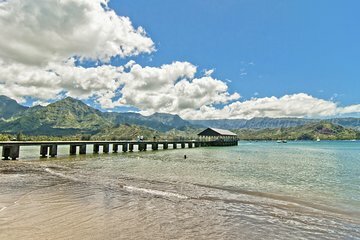 Halten Sie Ausschau nach dem Meer vom Kilauea-Leuchtturm und Hanalei Bay. Achten Sie auf Wale und die vom Aussterben bedrohten Gänse in einem Tierwelt-Refugium. Besuchen Sie Kauais versteckte Strände und antike Stätten. Erfahren Sie mehr über Kauais Geschichte und Kultur entlang der Straße. Our tour guide John was extremely knowledgeable. He went above and beyond showing us around. He even went out of his way when we would suggest a stop. A very good experience. Fantastic tour! Very exterienced guide and we had the day to leisurely stop and take our time! Perfect way to see some places on the island that you would not be able to find otherwise! Highly recommend! Our tour guide provided a wonderful day for us. We were able to experience highlights of the island, learn history and have great conversation. We stopped for a nice lunch mid way through our trip which was very enjoyable. I'm glad we made the decision to book the tour otherwise we would have missed some beautiful sites. P.S. She's a good photographer too! Very comfortable tour in a clean, air conditioned van with plenty of stops for pictures and exploring. We scheduled this tour for the first day of our vacation, which worked out great because it gave us a really good variety of siteseeing. Our guide was very knowledgeable. Elena was a wonderful tour guide! Since it was a private tour, she could customize the places we went according to our preferences. We had a fantastic day seeing so many beautiful places! I recommend this tour to anyone who wants a good overview of the island. We went on the northern route, but if weather is rainy there, our tour guide was prepared to take us on the southern route and out to see Waimea Canyon etc. Highly recommend this tour!!!! Had a super wonderful guide on out private tour and really enjoyed the day seeing the beauty of the island! I recommended this to everyone! Immensely enjoyed our tour of Kauai! Our guide Jon was excellent! Very knowledgeable of the area, accommodating to our schedule and preferences. We never felt rushed and got to enjoy the sites at our pace. Jon went out of his way to ensure that we got to see wild marine animals. Upon arrival, he asked whether we would like to alter our tour. The weather was amazing for a tour of the Waimea canyon and west side of the island -so we toured there instead. Very intimate tour. Our tour guide was attentive, professional, and delightful. The tour was tailored to our needs. Our tour guide picked us up at our resort and gave us scenic and historical information throughout We were able to ask any questions we had about Kauai and she was know.edgable in her answers. I would highly recommend this company. We thoroughly enjoyed our tour. John was excellent - very knowledgeable about everything. We were the only people on the tour and when John picked us up he went over what we would see in this tour, which is the south side of the island or the other tour that covers the north side. We asked which one he would recommend and he suggested the north side. We saw so many things and were lucky enough to see a Monk seal, sea turtles and several wild pigs. We would recommend this to everyone.